ABC Towers | Liberty Affordable Housing, Inc. In 2010, Liberty Affordable Housing assumed the ownership of ABC Housing Development Fund Company, Inc. when the Liberty Board was substituted for the ABC Board. 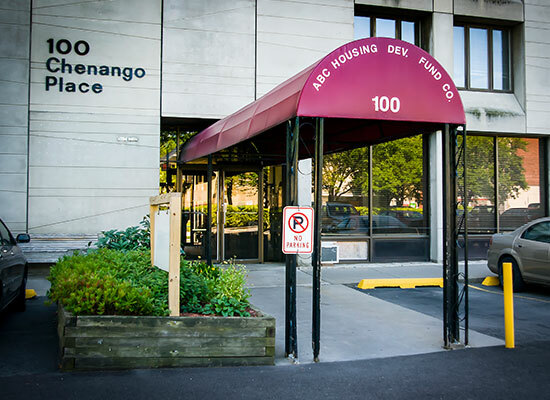 100 Chenango Place is a 144 unit low-income, senior housing complex located in the City of Binghamton, Broome County, New York. Funding Sources: The project was originally financed with an FHA insured, Section 236 mortgage and has an eighty-six unit, project based Section 8 contract. In 2011, Liberty was able to obtain a Weatherization grant through NYS HCR in order to complete some energy conservation related improvements.